Prints and actual cells from all 6 Star Wars movies! Limited edition film cell is beautifully mounted and framed. It will make a striking addition to your wall. 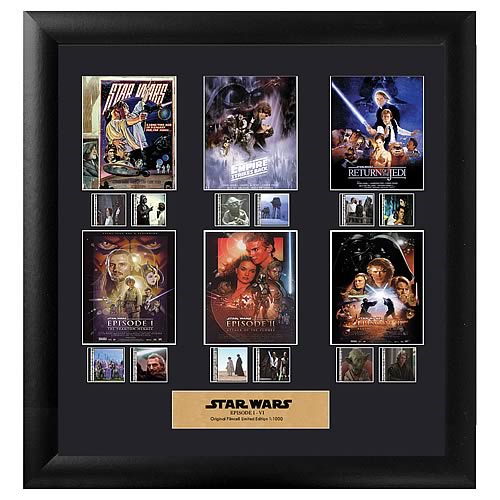 This stunning film cell features prints and actual cells from Star Wars: Episode I - The Phantom Menace, Star Wars: Episode II - Attack of the Clones, Star Wars: Episode III - Revenge of the Sith, Star Wars: Episode IV - A New Hope, Star Wars: Episode V - The Empire Strikes Back, and Star Wars: Episode VI - Return of the Jedi. It measures 20-inches tall x 19-inches wide, with all elements beautifully framed in black wood. A certificate of authenticity is included with this limited edition of 1,000 pieces that will make a striking addition to your wall. Please note: The actual strips of film vary from piece to piece, as they are hand picked from reels of film. We cannot accept requests for specific strips, nor can we accept returns on opened items. The cell strips you receive may be different from those pictured.